This approximately 9 inch by 13 inch watercolor, painted by Angela Marie Poches, shows a portion of the Capitol's interior. The view is from the Capitol's third-floor balcony and shows the Rotunda's mural of Agriculture, the symbol for the United States, the railings of other balconies, the terrazzo tile of the second floor below and much more. 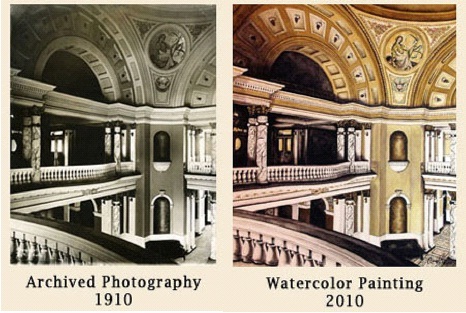 Poches' watercolor is based on a photograph from the State Archives that was taken of the Capitol in 1910. In the photos above, the 1910 photograph is on the left, while Poches' watercolor is on the right. The Rapid City artist said, "What I like about this piece is that we all drive past the building and admire the exterior, but we don't go inside. This piece for me really depicts the warmth and welcoming for people to see when they visit the interior." The South Dakota Historical Society Foundation is taking orders for numbered prints of the watercolor. The prints sell for $75 each, plus tax and shipping. The Print is available at the Heritage Stores at the Cultural Heritage Center and at the Capitol. People may call the South Dakota Historical Society Foundation at (605) 773-6346 to order prints or for more information about them.